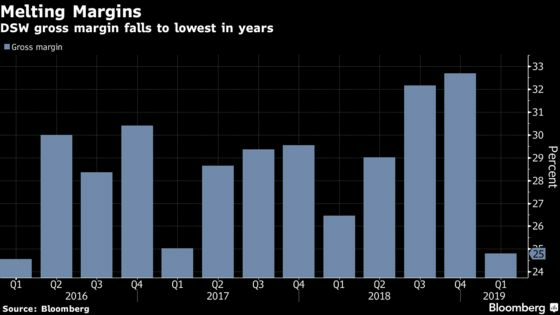 (Bloomberg) -- DSW Inc. fell the most in almost five years after the shoe retailer posted a surprise loss in the fourth quarter and its profitability got squeezed. The company’s long-term forecast laid out at the investor day in New York also didn’t satisfy Wall Street, with shares falling sharply. The loss per share amounted to 7 cents, the company said Tuesday. Analysts had estimated a gain of 3 cents. Gross margin, a gauge of its profitability, dropped to the lowest level in three years. DSW’s forecast, presented during its investor day event on Tuesday, may have spooked investors. The company sees low double-digit revenue growth in the current fiscal year, while comparable sales are expected to expand in the low single-digit range. The retailer may have had trouble clearing out merchandise as its inventories per square foot rose 5.9 percent from a year earlier, excluding goods from acquisitions. It also dealt with costs related to those acquisitions as well as exiting leases and other termination expenses. DSW plans to rebrand itself as Designer Brands and change its ticker to DBI on April 2. The name change reflects its growing portfolio: Last year, it bought the Camuto Group, a design and brand development business that owns the Vince Camuto line and holds footwear licenses for Jessica Simpson and Lucky Brand. The company may start to benefit from the gap left by Payless Inc., which plans to close all its U.S. and Puerto Rico stores in the coming months. It’s also been investing in ways to accelerate shoe sales. Last month, DSW said it would add nail salons to five stores in Texas, Ohio and Washington, D.C., after a successful test in two Ohio stores. The shares fell as much as 16 percent to $21.32 on Tuesday. They had risen 2.7 percent this year through Monday’s close, compared with the 13 percent gain in the S&P 500 Index. For more on the results, click here. For the company statement, click here.